I am all about getting a gorgeous summer glow that usually comes from laying under the sun. But during my last beach day, I ignored the “reapply sunscreen” memo and ended up with an(other!) obnoxious sunburn. So, when my friend Linda mentioned an easy, no-mess way to get the color I craved without baking in the sun I was skeptical. I haven’t used a sunless tanner since high school, and even then I was no fan. The closest I’ve come in recent years was a moisturizer that added a gradual glow after each application. Welcome, Tan Towel! These are a far cry from the greasy, oily, and streaky sunless tanners I once knew. The directions indicated that a natural-looking glow would appear within two to four hours and that the product could be applied two to three times a week for a darker hue. The individually packaged towelette had a slight citrus fragrance and unfolded into a sheet the size of a paper towel, which was perfect for applying color evenly to your entire body (it can also be applied to your face, but since I have sensitive skin I just used it on my body). After my shower, I began gently rubbing the towel in a circular motion, starting at my ankles and working my way up. The towel seemed moist enough throughout the entire process and did not leave my skin feeling wet or greasy afterwards. Once finished, I threw pajamas on and was ready for bed (don’t forget to wash your hands immediately after!). In the morning, I awoke to a nice, even glow that bears no resemblance to the Oompa Loompa I feared I might look like. The results were natural and there was no residue on my clothes or sheets. 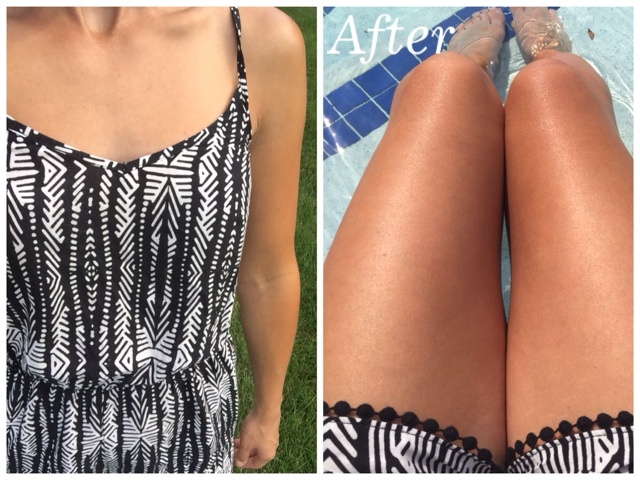 I will definitely be using Tan Towel to maintain my glow…and help get rid of unwanted tan lines between beach days. Thanks, Carmen. The color is perfect and I’ve received so many compliments on my tan! Interesting! I’m hesitant to use self-tanner as it has rubbed off on a lot of my clothes in the past. Can you use this product on your face safely? I was hesitant to use it at first, too. But I didn’t notice that it rubbed off on my clothes or sheets. I didn’t try it on my face as I have very sensitive skin, and typically try to keep my face out of the sun. Thanks, Robin! For a sunless tanner, the color looks even and natural. I was very pleased with the results, Natalia! I’m definitely going to be using Tan Towel in between beach days. Thanks, Kate! I’m loving the color and can’t wait to follow up with another Tan Towel. Thanks, Abby! The romper is one of my faves, too! Wow, this looks amazing! Thanks for sharing with us!